September 24, 2015 – This is a special, Pope-in-America edition of the History Author Show. Pope Francis began his visit to the United States on September 22, 2015 with stops in Washington, D.C., New York City and Philadelphia. Top on his agenda were calls for Americans to spend more on the poor. But what about the church’s finances? How did a humble ministry started by St. Paul two thousand years ago, grow into the largest and wealthiest on earth? Attorney, best-selling author, and award-winning investigative journalist Gerald Posner explores that question in his book: God’s Bankers: A History of Money and Power at the Vatican . It’s a book not about faith, but about finances. And it begs the question: Can the man called the people’s pope, Francis, overcome the resistance to change in the Vatican’s inner court, and rein in its excesses? Can the new pontiff, in short, succeed where all his predecessors failed? 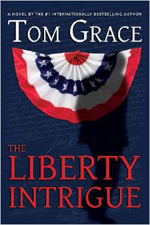 The Providence Journal called God’s Bankers “As exciting as a mystery thriller.” So I thought, who better to interview Gerald Posner than thriller author Tom Grace. Among Tom’s best-selling novels in the Nolan Kilkenny series is, The Secret Cardinal . It’s an adventure that races from the grandeur of the Vatican across the vastness of Asia, ultimately involving China, the Mafia, and the conclave of cardinals that will elect the next pope. Tom has vast knowledge of the Catholic Church, so he and Gerald had a lot to talk about in this bonus episode.